September Wood News is in your inbox! The newest edition of Wood News is now available for your reading pleasure. This month, our Down to Earth Woodworker, Steven Johnson, offers up a perspective on turning pro that most people probably haven’t considered. Customer Richard Rank tells the story of his family’s woodworking wishlist for him, and how he was able to check the first item off. Ed Grant’s inspiring shop and Ted Marrinan’s impressive first-time woodworking projects are featured in our Show Us Your Shop and Show Us Your Stuff columns. Highland Woodworking’s new and improved YouTube channel is up and running with many entertaining videos for you to watch. And the usual truckload of great deals on our products are there too, of course. Take a look at the September edition of Wood News right now! 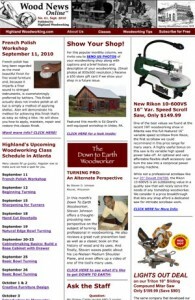 And if you aren’t receiving Wood News yet, sign up today!